Get these Deals for a limited time only! Campers picked up after 6:00pm will incur a $25 late pickup fee. and is not available for purchase for individual days or partial weeks. Note: All campers are required to wear a Slam City Camp Tee Shirt to camp as part of their camp uniform. Camp Tee Shirts are not included in the camp registration price. The cost for the camp tee is $20 each. Camp tees can be ordered online at www.slamcitymanagement.com and will be distributed the first day of camp. Campers are required to wear athletic shorts and basketball shoes in order to participate in Slam City camp activities. Campers are not permitted to wear cargo shorts, jean shorts, or sandals. 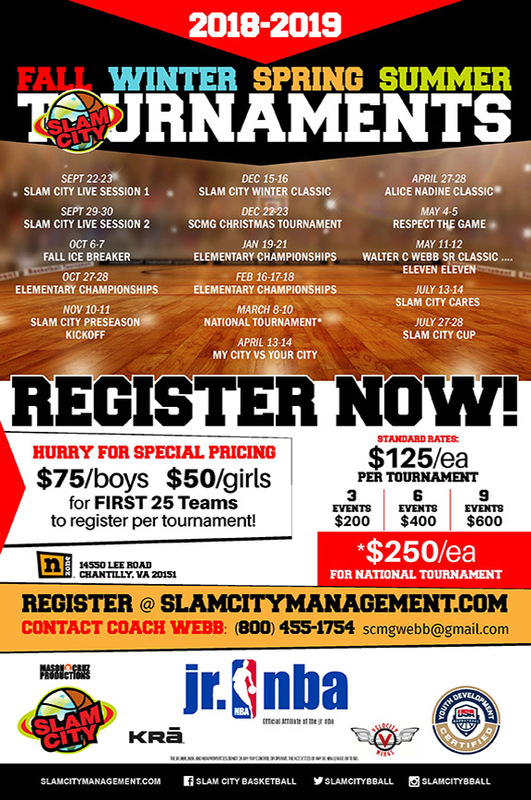 All Slam City programs are non-refundable. All campers are required to purchase a camp tee shirt as part of their camp uniform. Camp Tee Shirts are not included in the camp registration fee. Camp Tees can be ordered in the "Online Store" at www.slamcitymanagement.com and will be distributed the first day of camp. All campers are required to wear athletic shorts and basketball shoes in order to participate in Slam City Camp activities. Campers are not permitted to wear cargo shorts, jean shorts or sandals. *Requires saved credit card on account. NOTE: A $25 late pick up fee will be assessed for campers picked up after 6:00pm. All campers are required to purchase a camp tee shirt as part of their camp uniform. Camp Tee Shirts are not included in the camp registration fee. The cost for the camp tee is $20 each and can be ordered in the "Online Store" at www.slamcitymanagement.com and will be distributed the first day of camp. All campers are required to wear athletic clothing, shorts, leggings, etc. and sneakers in order to participate in Cheer City Camp activities. Campers are not permitted to wear cargo shorts, jean shorts or sandals. A $25 FEE WILL BE CHARGED FOR CAMP CHANGES MADE AFTER APRIL 1, 2018. Note: All campers are required to wear a Cheer City Camp Tee Shirt to camp as part of their camp uniform. Camp Tee Shirts are not included in the camp registration price. The cost for the camp tee is $20 each. Camp tees can be ordered online at www.slamcitymanagement.com and will be distributed the first day of camp.